Dharamshala: The spiritual leader of Tibet, His Holiness the Dalai Lama and the 'daughter of Burmese democracy' met in London yesterday, June 19, 2012. The 76-year- old Nobel Peace Prize winner was holding his annual Buddhist teachings in the British capital and Aung Sung Suu Kyi was returning 'Home'. 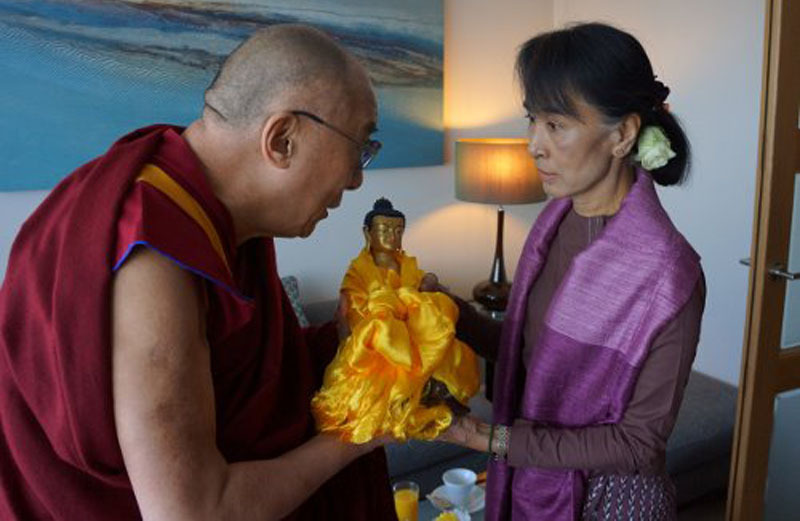 She made a private visit to His Holiness the Dalai Lama in the morning. The two Nobel laureates spoke for about half an hour. The Dalai Lama spoke confidently that like her father she would do humanity a great service. He was quoted saying "I have real admiration for your courage. I am very happy we've been able to meet." His Holiness continued onward to the University of Westminster to deliver his CR Parekh lecture. During the lecture he brought about the contrast in the policies of China and India. Aung Sun Suu Kyi was travelling to Oxford. It had been where she started her family with her late husband, Michael Aris. She hadn't been there in nearly 24 years. It was a bittersweet occasion as she was unable to attend his funeral in 1999 because of her house arrest. She had been under house arrest within Burma by the military junta for 15 years. Her victory in the elections in 1990 was considered void by the military regime. Since her internal exile she has campaigned for a democratic Burma and on April 1st of this year was able to successfully win a seat in the lower house of the Burmese parliament. Many draw comparisons with the Tibet and Burma. Some have declared Suu Kyi and Dalai Lama as part of the Trinity which includes Nelson Mandela. Unlike Mandela, they have not been to realize their goals as yet.